A better job, advised their sources (i.e., the cows). Except as my wagon-pull crew? To learn more than syntax. But everything turned out just fine. They now build apps to filter spam. Write your own computer programs? To upgrade your personal RAM. Do you have a clever (and family-friendly) limerick about math or computer science to share? Email us at info @ eimacs.com. Stop horsing around and come on over to IMACS. Take our free aptitude test. Play along with our weekly IMACS logic puzzles on Facebook. Introducing … The IMACS Blog! Terry Kaufman with student at the IMACS Hi-Tech Summer Camp Open House. Welcome to the IMACS blog. Check in with us from time to time for mathematical musings and more. Since this is our inaugural blog post, we’ll be utterly predictable and start with the obligatory interview with the president. No, not that president. We mean our very own Terry Kaufman, president, co-founder and all-around good guy, at the Institute for Mathematics and Computer Science, lovingly known as IMACS. Q: So, Terry, why did you start IMACS? A: My dad, Burt Kaufman, had been working with mathematically talented students for as long as I can remember, whether it was developing curriculum or teaching them in the classroom. 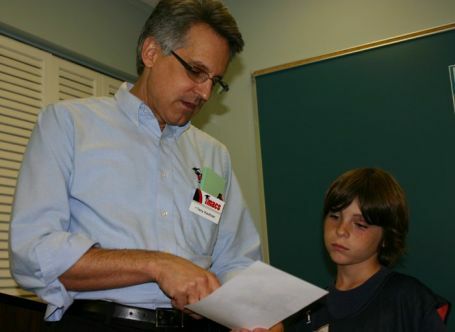 The programs he was involved with ultimately brought him back to South Florida where the Broward County public school system agreed to fund what was then called Mathematics Education for Gifted Secondary School Students (MEGSSS). Project MEGSSS had a successful run in Broward County from 1983 to 1993, but then fell to the budget cutting axe. Well, my oldest child was only two at the time, and I thought to myself, “You know, I really want him to have the benefit of this curriculum.” I’d seen with my own eyes the enthusiasm for math and computer science that my father’s students had when they studied this material. So I said to Ed [Martin] and Iain [Ferguson], our senior curriculum developers for math and computer science who were also teaching MEGSSS students at the time, “Let’s find a way to keep this thing going.” And IMACS was born, really out of a parent’s wish to have high quality math and computer science education available to his child. Q: What’s the latest news at IMACS? What big goals are you and the team working towards? A: We’re always working on new online computer courses. One initiative that we’re really excited about is our Online Virtual Robotics Lab in which students program robots in a virtual world. It’s entirely Web-based, but the actual physical behavior of real robots is accurately represented, even the appropriate laws of physics. What we’ve put together is a learning environment that integrates science, technology, engineering and math skills in a very natural way. Several schools are already using it as part of the national STEM Initiative, and we expect that number to grow. Another of our programs that comes to mind is ISLAND, which stands for Interface for Scientific Learning & Natural Discovery. Here we use computer simulations and some really innovative online activities to encourage students to think scientifically and get involved in the learning process. Rather than simply being told dry scientific facts, they learn by doing – making hypotheses, observing simulations, and then developing scientific theories. They’re so engaged that they don’t realize they’re learning the required state standards. You know, people have traditionally thought of IMACS as a place for gifted and talented students, but the truth is that our teaching philosophy is really applicable to all students. With ISLAND, it’s been very gratifying to be able to share the benefits of our unique approach with a wider audience. Q: Any message for the lucky folks who stumble upon this blog? A: Yes! Read it. Share it. Tell us what you think. We are listening. There’s such a strong sense of community among our students, parents, teachers and alumni; it’s time we share that enthusiasm online. Obviously, we’d love for this blog and our Facebook page to be go-to places for people interested in taking online computer programming classes. But more importantly, we know from our many years of teaching mathematically talented students that we have a huge amount of knowledge in our heads on how to bring out the best in them, how to help them reach their full potential. Why keep it there? And we also know that our parents and students have great advice to give too. They share their stories with us face-to-face or in letters all the time. Now there are at least two places where these stories can find a wider audience and maybe help someone who is searching for this kind of information. If you’ve read all the way to the end of this blog post, then our first attempt couldn’t have been all that bad! Do you have a topic to suggest for our blog? Leave a comment. Find out if you’re ready for the IMACS experience. Sign up for our free aptitude test. Follow IMACS on Facebook.